Beneath the road-friendly surface of the 2010 Range Rover Sport lies a true off-road vehicle, but that's not something every buyer needs or wants. Make sure it's something you truly desire before buying. 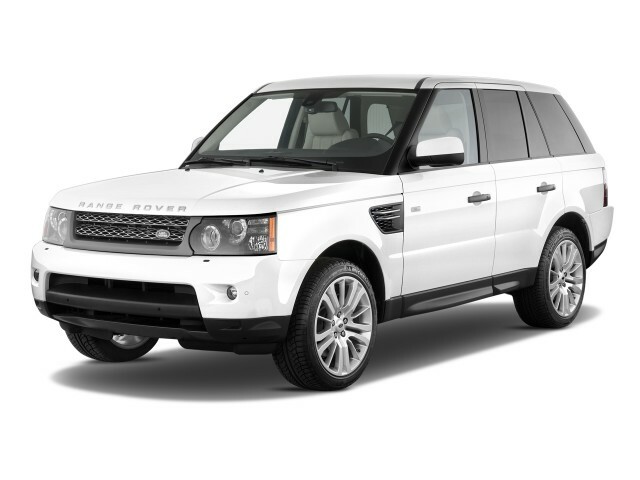 The 2010 Land Rover Range Rover Sport offers impressive performance and features, whether on-road or off. TheCarConnection.com's editors took the wheel of the new Land Rover Range Rover Sport to bring you an expert opinion along with thorough research from around the rest of the Web to help you make a complete, informed decision. The 2010 Land Rover Range Rover Sport melds a sleeker, more defined profile than its bigger brother the Range Rover with a chassis tuned for on-road performance over hard-core off-roading. That's not to say it isn't ready for woodsy trails or dusty deserts, and it looks the part, too, recalling the look of earlier Range Rovers with its thin roof pillars and upright, bold presence. Major interior revisions improve the look and feel throughout the cabin. The Range Rover Sport delivers its impressive performance in two models: the Range Rover Sport HSE and the Range Rover Sport Supercharged. With new 5.0-liter engines for 2010 replacing the previous 4.4- and 4.2-liter naturally aspirated and supercharged units, power is up to 375 horsepower and 375 pound-feet of torque for the HSE and a massive 510 horsepower and 461 pound-feet of torque for the Supercharged. That's enough to get the big SUVs up to 60 mph in a hurry: 7.2 seconds for the HSE and a sports car-like 5.9 for the Supercharged model. Both engines are paired with a revised six-speed automatic transmission with manual shift mode. Big disc brakes help both models handle all that power, while an updated and retuned Dynamic program takes advantage of the upgraded suspension elements and chassis stiffness also introduced this year. Despite weighing more than 5,500 pounds, the Range Rover Sport delivers impressive handling, though the hefty curb weight does mean fuel economy is poor, with the HSE rated at 13/18 mpg city and highway, and the Supercharged rated at 12/17 mpg. Editors at TheCarConnection.com have driven the 2010 Land Rover Range Rover Sport both on- and off-road. The full-time four-wheel-drive system adds an extra punch of acceleration on the pavement, and performs sure-footedly on gravel, mud, and snowy winter roads alike. Curvy-road performance is where the Range Rover Sport line shines, hustling the bends well enough to resemble a sports car, except for its ever-present weight. Off-road, that weight isn't much of a penalty, and even the street-focused stock tires are unable to restrain the Land Rover engineering, advanced differentials, traction control and hill descent algorithms. Inside the cabin of the Range Rover Sport, the interior is almost all-new for 2010. Though the design looks familiar, a reduction of buttons and an improvement of materials throughout make for a much-improved and positively luxurious experience. Things are a bit snugger than you'd expect from a large SUV, though up front the cockpit-like feel is intentional, helping to immerse the driver in the experience. Visibility is good thanks to ample windows. High-quality leather, wood, and wool carpeting complete the luxury experience of the Range Rover Sport. 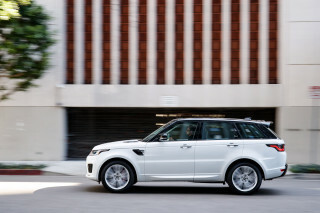 Safety continues to be a Range Rover Sport strong suit, with advanced stability control, hill descent control, and active roll mitigation helping to keep the vehicle upright and pointed the right way down the road even during emergency situations. Front and rear-seat passengers are protected by airbags, and standard anti-lock brakes with brake assist and electronic brake force distribution help maintain stability under braking. As with many expensive SUVs, there is no crash-test data from NHTSA or the IIHS. A wealth of technology lies just beneath the surface, accessible through the 5-inch TFT instrument panel and dash-mounted touch screen. Most of it is dedicated to managing the Range Rover Sport's impressive Adaptive Dynamics System and Terrain Response System, which allow the vehicle to perform its on-road and off-road feats by tuning the response of the adjustable dampers, and enhanced steering feel lets the driver better sense what the chassis is doing. All of this is displayed in real time on the display screen. The instrument panel also displays a host of information and is itself a digital display that reconfigures to show the most relevant information depending on the driving mode selected by the center console-mounted knob. All-new for the Supercharged for 2010 is the Dynamic program, which maximizes performance on-road-and it's a noticeable transformation when you change on the fly. Aside from the powertrain, the primary differences between the 2010 Range Rover HSE and Supercharged versions lie in the features; most of what is optional on the HSE comes standard on the Supercharged. 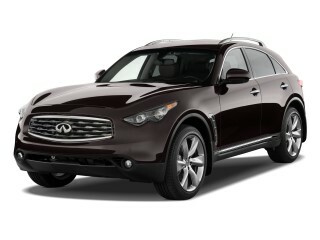 Both models receive significant improvements for 2010, including more extensive use of leather and soft-touch materials. 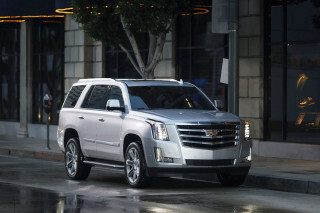 Available options include a beverage cooler, a rear-seat entertainment system, and much more. An Autobiography Limited Edition package adds duo-tone leather, embossed headrests, exclusive exterior colors, and a number of other features, including 20-inch alloy wheels and a unique mesh grille. Well styled outside and much improved inside, the 2010 Land Rover Range Rover Sport is the best yet. The 2010 Land Rover Range Rover Sport melds a sleeker, more defined profile than its bigger brother the Range Rover with a chassis tuned for on-road performance over hard-core off-roading. That's not to say it isn't ready for woodsy trails or dusty deserts, and it looks the part, too, recalling the silhouette of earlier Range Rovers with its thin roof pillars and upright, bold presence. Kelley Blue Book sums up the 2010 Range Rover Sport's styling, praising the way it blends the upright styling of the standards Range Rover with a more aggressive profile to "appear as if it is moving quickly, even when at rest." Edmunds also likes the Range Rover Sport's exterior appearance, calling it "an enjoyable and luxurious vehicle to drive as well as look at." 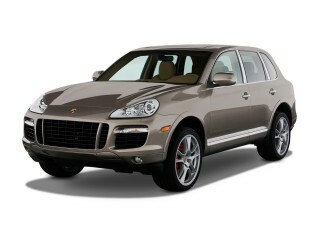 Motor Trend agrees, describing the SUV as having "posh good looks." Criticism of previous models for cheap trim pieces is gone with the revised interior for 2010. Major interior revisions improve the look and feel throughout the cabin. Among the changes is a simpler, cleaner dash. As Edmunds notes, "the multitude of buttons and switches have been reduced by half." Car and Driver likewise praises the improvements to the interior, saying "anything that isn't wood-trimmed or covered by leather is made of high-quality materials." The same reviewers even go so far as to assert it's "on the same level as an Aston Martin or Rolls-Royce interior"-high praise indeed. Complaints about previous models' hard-to-read gauges are likewise gone, thanks to the 5-inch TFT display that replaces previous analog gauges. ConsumerGuide states, "[g]auges are clearly marked and easy to read." Cars.com notes, however, that "the screen catches glare badly and can sometimes be difficult to see." There remains some complexity due to the high-tech nature of the 2010 Range Rover Sport's features, too. ConsumerGuide reports that "setting Terrain Response, hill-descent control, and other off-road gear puzzles the uninitiated." The 2010 Land Rover Range Rover Sport's upgraded powertrain delivers impressive performance on-road and off, but be prepared for below-average fuel economy. The Range Rover Sport delivers its impressive performance in two models: the Range Rover Sport HSE and the Range Rover Sport Supercharged. With new 5.0-liter engines for 2010 replacing the previous 4.4- and 4.2-liter naturally aspirated and supercharged units, power is up to 375 horsepower and 375 pound-feet of torque for the HSE and a massive 510 horsepower and 461 pound-feet of torque for the Supercharged. That's enough to get the big SUVs up to 60 mph in a hurry: 7.2 seconds for the HSE and a sports car-like 5.9 for the Supercharged model. Car and Driver says the Supercharged's "new engine delivers a serious shove," and notes that the naturally aspirated HSE's engine now "seems to have an appropriate amount of power, rather than feeling hopelessly overweight." Beyond the raw acceleration delivered by the new engines, Cars.com praises the "stable, confident highway ride." This ride is only enhanced in the Supercharged model thanks to the addition of the Dynamic mode to the Terrain Response System, as Motor Trend notes: "makes the throttle and shift programming more aggressive while tightening control" of the SUV's suspension. Despite weighing more than 5,500 pounds, the Range Rover Sport delivers impressive handling, though the hefty curb weight does mean fuel economy is poor, with the HSE rated at 13/18 mpg city and highway, and the Supercharged rated at 12/17 mpg. Curvy-road performance is where the Range Rover Sport line shines, hustling the bends well enough to resemble a sports car, except for its ever-present weight. Off-road, that weight isn't much of a penalty, and even the street-focused stock tires are unable to restrain the Land Rover engineering, advanced differentials, traction control and hill descent algorithms. AutoWeek sums it up, calling the Range Rover Sport "very impressive for a 5,600-pounder with these kinds of off-road underpinnings." Big disc brakes help both models handle all that power, while an updated and retuned Dynamic program takes advantage of the upgraded suspension elements and chassis stiffness also introduced this year. Car and Driver remarks, "the shocking thing about the Range Rover Sport is how amazingly well it stops." Editors at TheCarConnection.com have driven the 2010 Land Rover Range Rover Sport both on- and off-road. The full-time four-wheel-drive system adds an extra punch of acceleration on the pavement, and performs sure-footedly on gravel, mud, and snowy winter roads alike. Speaking of off-roading, Automobile reviewers are "quite impressed by its capabilities in the mud," and that the 2010 Range Rover Sport is "willing and able to tackle far tougher terrain than its owner is likely to attempt." Aside from some minor issues with noise and space, the 2010 Land Rover Range Rover Sport's cabin is luxuriously appointed and comfortable. Inside the cabin of the Range Rover Sport, things are a bit snugger than you'd expect from a large SUV, though up front the cockpit-like feel is intentional, helping to immerse the driver in the experience. A revised interior does away with the cheaper-seeming elements that had found their way into the previous Sport, and visibility is good thanks to ample windows. High-quality leather, wood, and wool carpeting complete the luxury experience of the Range Rover Sport. Noise is fairly well-controlled in the cabin. ConsumerGuide does note "wind and road noise at highway speeds," however, and the "supercharger whines in fast acceleration, but it never annoys." Car and Driver looks past the noise to the materials and comfort, saying the 2010 Range Rover Sport's interior is "its best and most unique feature," and even going so far as to say it is "on the same level as an Aston Martin or Rolls-Royce interior." Usability of the high-tech features is also improved this year, as ConsumerGuide points out, "[m]ost major controls use well-identified buttons and knobs that are easy to locate and operate." The 2010 Land Rover Range Rover Sport's "shortened wheelbase means slightly less passenger and cargo capacity," according to Kelley Blue Book. The Range Rover Sport also comes up short on child-friendly features, warns MotherProof, remarking "the Rover couldn't handle...kids' booster seats." ConsumerGuide says that "head clearance is adequate, but larger passengers lack wiggle room in the footwell, which is pinched by a wide center console and the low dashboard housing." Improvements to the seating for 2010 mean "[o]ptional adjustable side bolsters help the front seats fit drivers of all sizes and the seats are more comfortable to boot," reports Automobile. ConsumerGuide agrees, noting that the "firm and astutely contoured seats provide excellent support and the drive position is fine." Storage and cargo space aren't all bad, however. ConsumerGuide notes that "the two-step rear-seat folding process creates a relatively long and flat load floor," and the unique two-tier glove box and various small bins "contribute to good small-item storage space." As Cars.com reports, "interior cargo room measures 33.8 cubic feet but grows to 71 cubic feet when the 65/35-split rear bench seat is folded." 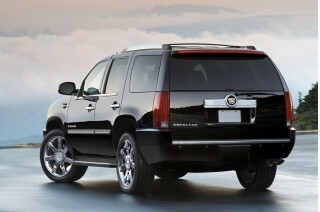 Edmunds remarks, however, that "the sloping rear window can hamper the loading of large and bulky items." Though the 2010 Land Rover Range Rover Sport hasn't been rated by the major crash-testing agencies, its extensive selection of safety features provides a sense of security. Despite the lack of official safety ratings, the 2010 Land Rover Range Rover Sport does offer a wide range of standard safety features. 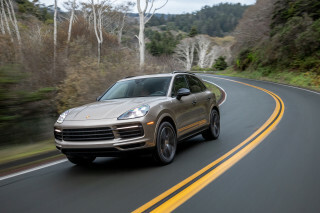 Cars.com highlights the "antilock brakes, side-impact airbags for the front seats, side curtain airbags, an electronic stability system with rollover mitigation technology, and front and rear parking sensors." Edmunds adds that the Supercharged is available with radar adaptive cruise control that works in concert with an advanced emergency braking system that "uses the forward-looking radar to determine if a collision is imminent and primes the braking system." Large windows and an upright seating position "give the driver a commanding view of the road," though "large C-pillars...limit visibility" when looking rearward. Added features put the 2010 Land Rover Range Rover Sport near the front of the segment, but beware the quickly mounting price. A wealth of technology lies just beneath the surface of the 2010 Land Rover Range Rover Sport, accessible through the 5-inch TFT instrument panel and dash-mounted touch screen. Most of it is dedicated to managing the Range Rover Sport's impressive Adaptive Dynamics System and Terrain Response System, which allow the vehicle to perform its on-road and off-road feats by tuning the response of the adjustable dampers, and enhanced steering feel allows the driver to better sense what the chassis is doing. All of this is shown in real time on the display screen. Automobile points out that all this technology isn't just for show, noting that the "surround-view camera system is very helpful during off-road excursions," as well as "during parking maneuvers to keep those big wheels free of scuffs." Edmunds also likes this system, and remarks that it "displays the predicted path of a towed trailer when backing up." In addition, Cars.com praises the vehicle's adaptable air suspension technology that "adjusts automatically to the road under its wheels." According to Cars.com, the 2010 Range Rover Sport features "a new hard drive navigation system that is faster than the previous version in the Range Rover Sport." AOL Autos also notes that standard equipment in the 2010 Range Rover Sport HSE includes a "power sunroof, 19-inch alloy wheels, bi-xenon headlights, leather upholstery and genuine wood trim details," while the Supercharged adds "20-inch wheels, an adaptive front lighting system with automatic high beam assistant, heated front and rear seats and satellite radio." The instrument panel also displays a host of information and is itself a digital display that reconfigures to show the most relevant information depending on the driving mode selected by the center console-mounted knob. All-new for the Supercharged for 2010 is the Dynamic program, which maximizes performance on-road-and it's a noticeable transformation when you change on the fly.